Hereby Sawit Watch expresses before the European Parliament, the European Commission, the governments and citizens of the European Union, its deep concern over the policies being adopted which promote the use and import of biofuels as an alternative to fossil fuels. Their disproportionate use is one of the new driving forces of large- scale and monoculture oil palm plantation expansion that contributes to global warming, social conflicts and rights abuses in producing countries, particularly Indonesia. 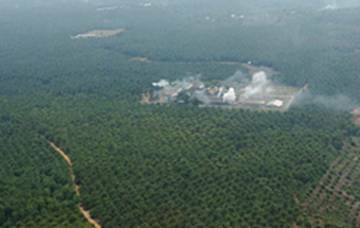 Oil palm plantations have been commercially developed in Indonesia since 1911. Until 2005, oil palm plantations have covered 6.04 million hectares, and existing regional development plans allotted a further 20 million hectares for oil palm plantations. Amazingly, oil palm plantations planting rate to have reached 400,000 ha annually. We are very concerned by the fact that oil palm plantations are a major cause of deforestation, forests fires, land and water pollution, and are being imposed on local communities and indigenous peoples without concern for their rights, livelihoods or welfare, and managed with insufficient concern for the rights and welfare of plantations workers and smallholders. Up to 2006, there have been 350 conflicts related to land issues against oil palm plantation evelopments in Indonesia. These unresolved conflicts, will get worse if the current biofuels policy is put in place. They will deprive further local communities and indigenous peoples from their lands and livelihoods. Biodiesel from palm oil requires intensive capital investment to make it profitable. If an oil palm plantation and one mill are developed to produce crude palm oil on an economic scale, it only needs 20,000 hectares, whereas the development of an economically viable and profitable oil palm plantation for biodiesel requires a minimum of 50,000 hectares. In light of the high demand for palm oil biodiesel from European markets, the government of Indonesia and the Association of Indonesian Palm Oil Growers (GAPKI), seeking to also ensure continued supplies for existing European food markets, have mutually agreed to allot 3 million hectares of land for oil palm plantations for biodiesel production in Indonesia. The Indonesian President has expressed commitment to move ahead with agrarian reform through land distribution for farmers. This is contrary to the presidential decree to encourage biofuels development for the sake of poverty and unemployment alleviation trough large- scale oil palm plantations for biofuel production. The situation described above has led to extreme concentration of land and natural resources in the hands of only a few business people from the oil palm plantations and palm oil industries. The potential implication of such mutually adopted policy in favour of palm oil expansion is obvious: Millions of hectares of Indonesian lands will be under the absolute control of major oil palm plantation groups and a few conglomerates. It is therefore unavoidable that, as a consequence of Europe’s biofuels policy, the land rights of indigenous peoples and local communities will be relinquished further, and that food security will be undermined and lands for agricultural purposes and subsistence livelihoods will diminish. The sense of environmentally friendly and reducing greenhouse gases by producing biofuel from palm oil will make no sense to protect global climate because million of Indonesians are adversely affected by this policy and will further hampering resolution of existing conflicts and protection of the only planet. The idea of palm oil biodiesel being environmentally sustainable and climate friendly makes no sense: Emissions from deforestation, peat drainage and fires release vast amounts of greenhouse gases and fuel global warming further. Palm oil expansion directly affects millions of Indonesians and will further hamper resolution of existing conflicts and protection of the global environment. Global justice and solidarity are the only way to end starvation and to alleviate poverty. Reducing palm oil consumption will help to create more acceptable living conditions in the southern countries, including Indonesia. Development without justice is not development, it is exploitation! Sawit Watch is an Indonesian Non-Government Organisation, group of individuals concern with adverse negative social and environmental impacts of oil palm plantation development in Indonesia. Sawit Watch’s (Oil Palm Watch) individual members work in 17 provinces where oil palm plantations are being developed. Sawit Watch seeks to promote social justice through rights based approaches.